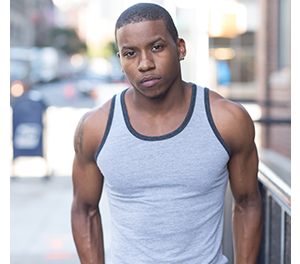 Born and raised in the South Bronx, Kevin Glasford was heavily entertained by the artistry of dance. He grew up watching many icons such as Usher, Omarion, Wade Robson, Ne-yo, Chris Brown, and the greatest of them all, Janet and Michael Jackson. During his senior year at Cardinal Hayes High School, Kevin lost his mother and was in need of a positive outlet. After meeting a friend who was also a dancer, Kevin found his new inspiration that would send his entire focus into the world of dance. Broadway Dance Center has been the main studio where Kevin received most of his training. However, other sources such as Hip-Hop Dance Conservatory, Steps On Broadway, Lehman College, and Downtown Dance Factory have been great contributors to his dance education. Outside of performing, lighting and theater work have taken Kevin’s interest. He also has a strong love for becoming a DJ. He’s always had a love for sketching, poetry, singing, playing the drums at his church, and his newfound love for fitness training. Rhapsody James, Lyle Beniga, Neil Schwartz, Ryan Davis, Luam, Valentine Norton, Candance Brown are just a few choreographers/ dancers that have inspired Kevin’s dance career. Others include Alonzo Williams, Aurelia Michael, Ronald Coleman, La Jon Dantzler, Ryan Miller, Brian Puspos, Bam Martin and Maurice Dean.